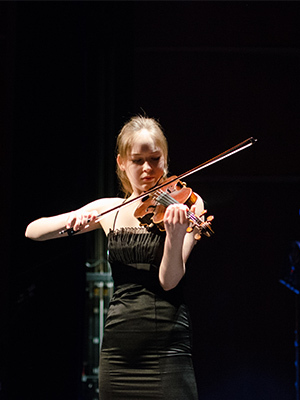 Geneva performed on Show 306 in South Bend, IN, with the Incendium Quartet on May 8, 2015, at age 16. She later performed on Show 322 in Davis, CA, on March 18, 2016, at age 17. Geneva Lewis, (violin), 17, is originally from New Zealand, and now lives in Irvine, California. She studies violin with Aimee Kreston at The Colburn School. Her string quartet won the gold medal in the junior division of the 2015 Fischoff National Chamber Music Competition. Geneva has also won the Grand Prize of the ENKOR Competition. 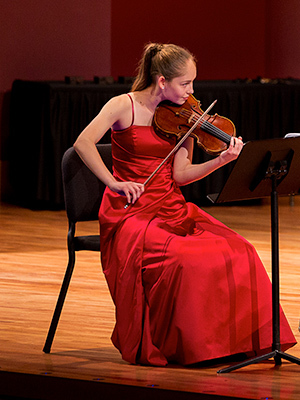 In addition, she competed in the Menuhin competition in 2014. Geneva plays on a 1991 Terry Borman violin, loaned by the Doublestop Foundation. In her free time she loves to play tennis, dance, and travel.